Many of the pages in this section came from my blog and like a blog, some of them are more like an incomplete show and tell. I'm going to rewrite, edit, or add to the pages as I get time. Meanwhile, I have linked those blog pages in the right sidebar. My garden is located just 14 or 15 feet from the back of my house. The garden currently measures 25 feet by 50 feet. When it was first cut, it was a little smaller than that. A vegetable garden requires full sun during most of the day. It is okay if parts of the garden are shaded during the early morning or during late evening, but for most of the day - it will need full sun. My garden is a vegetable garden but I do not limit it to vegetables. I plant herbs and flowers in the garden as well as vegetables. The flowers and herbs attract pollinators and butterflies and it looks nice. You will know that it is time to plan your garden when you start receiving seed catalogs in the mail. I start getting the catalogs during the first week in January. Typically, when I plan my garden layout, I print a sheet of graph paper from Graph Paper. On my old printer, I printed it in "draft" so that the lines would be gray. ( I've made a new graph paper that is for gardens. 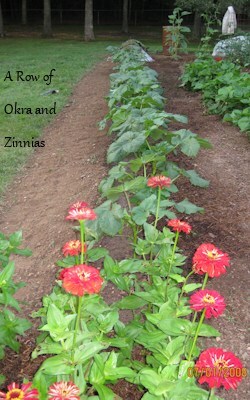 It is linked at the Plant a Kitchen Garden page. ) Basically, decide what you want to grow, then decide how much of it that your garden has room to support, and then make the plan on graph paper. Typically when vegetable plants are at local nurseries, then it is either time to plant or it is getting close to planting time. Summer vegetables are usually planted some time after the last frost. Some plants require a certain degree of warmth in the dirt. Plants like onions and potatoes are planted early in the year (winter). Plants such as lettuce, broccoli, and cabbage are typically for spring and/or fall gardens. Depending on where you live, you could have something in your garden year-round or almost year-round. High School Diploma - The diploma pictured here, but without the border. The file is a typeable PDF.